The Grover Beach Police Department is planning on evicting residents of a homeless encampment next week. Most of the people living at the camp have rebuffed attempts by city employees and social services workers to get them to relocate. 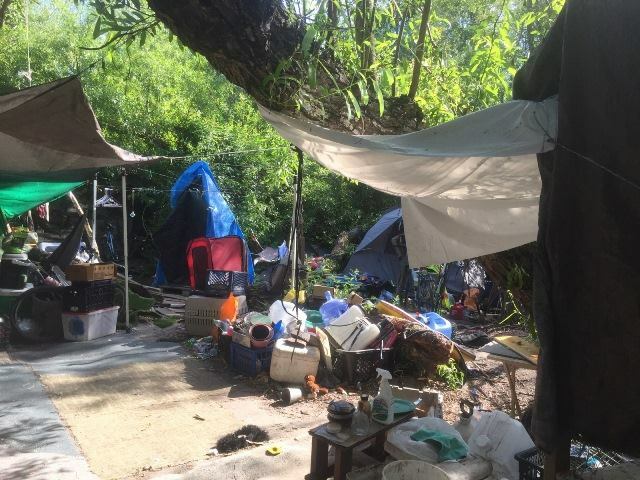 On Monday through Wednesday, Grover Beach police will partner with state parks workers and the California Conservation Corps to clean up homeless camps located off 4th Street and El Camino Real. The encampments are situated in an estuary area on the border of Pismo Beach and Grover Beach. 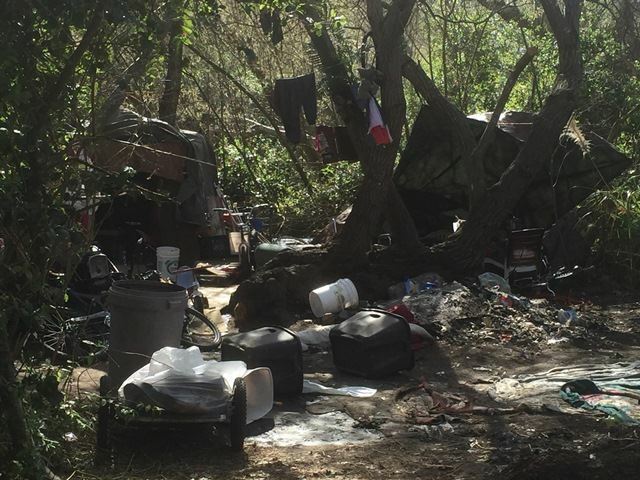 In January, city workers cleaned out another popular homeless encampment, which was located along Highway 1 south of the Grover Beach train station. The city is planning a $2 million expansion of the train station. Since January, the police department and state parks have been working to relocate people who are living in the camps along 4th Street and El Camino Real. Multiple social services agencies have offered the homeless individuals relocation and rehabilitation services. Some of the homeless have relocated or joined programs, but most people have not accepted the limited available assistance, according to the police department. When the city evicted the homeless from the Highway 1 encampment, officials cited health concerns in addition to the train station expansion. A stabbing occurred at that encampment earlier in January, and other criminal activity was also suspected at the camp. Following the eviction, some of the homeless moved to a campground in Pismo Beach. Dee Torres-Hill, who runs SLO Housing Connection, and other nonprofit workers courted the homeless, saying they would attempt to place them in housing. On Tuesday and Wednesday, clean-up work will impact traffic in the 800 and 900 blocks of North 4th Street and the 700-900 blocks of El Camino Real. Officers will set up a traffic lane diversion, but the roadways will remain open. We make it easy for homelessness to be a “lifestyle choice”. To be honest, any US citizen wanting to work should be put to work, and be given a salary. But I love America, and I love anyone wanting to work hard. I believe if a person needs a job, they should go to the unemployment office, show proof of US citizenship, pass a drug test, and if they can pass, then they sign some paperwork and be put to work based on their particular set of skills. If you have no skills, you can pick up trash on the beach at minimum wage. If you have a degree in engineering, obviously a job will be found for you that pays more money. If a person cannot pass a drug test but wants to work, I don’t think they should be denied employment, but they are going to have to be tasked with something like working in the fields, mowing lawns, or something that requires them sitting on a bus or requires supervision or something that if the worker walks off, it isn’t crucial. I don’t know. My basic point is, we need to stop giving handouts. No handouts for homelessness. This crap reminds me of when my kids mess up their rooms or when a hoarder makes a huge disaster. If you clean it up for them, they don’t learn from it, because it is a mental condition and they DO IT AGAIN. 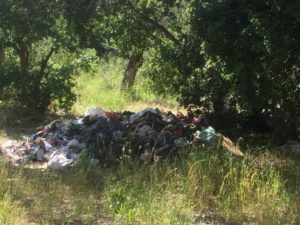 I like your thoughts on no hand outs but the non profits that helped the bums in Oceano last go around by giving them passes at the campground don’t help this problem, and as long as these”help” agencies are around we won’t ever solve this problem,build the 200 bed dump in SLO and they’ll be here. I’ve said several times here that they need to be rounded up and put in a camp to get drug and booze free and sent back to where they came from, if they are from here then put them to work at some point, there are no free rides. What you describe was the case in the 70’s. The mentally ill homeless who could not take care of themselves were placed in very low-security dormitory-style state hospitals with treatment and vocational programs. When released many were motivated not to go back; doesn’t take much to live in an SRO and pick up a little work. This ended due to an unholy alliance between Democrats who argued that you should not be held against your will by the state short of having been charged and convicted of a crime and Republicans eager to cut expenses (if you were short-sighted enough to believe that, my Republican father was not). You were not allowed to live and s**t in the creek (BTW, what’s the point of the $100 million SLO City sewer plant upgrade to an already high-level facility when s**t is allowed to be directly deposited into the creek? I once saw a 3′ wide, 2′ deep pile under a horizontal tree branch eroding during a rainstorm). Hobo camps were along railways and highways, sparsely populated, and used by travelers/bums who were largely pleasant and respectful to the locals and if not were offered the option of a ride to the either the northern or southern city limits by the police with instructions to keep on movin’. Right but the nonprofits work with the city councils and police to close down all those railway and highway encampments. Union Pacific actively goes after people attempting to ride the train and people camping on their property now. It’s like a sealed plastic bag with air, if you push down on one area, the air is just going to move to another. It was fine the way it was: cost of services was less, encampments were out of public view, and we avoided having to violate anyone’s right to simply exist. “any US citizen wanting to work should be put to work”, even some not wanting to work should be put to work, or cut their taxpayer funded assistance. While we are at it, a passing drug test should be required before receiving or continuing assistance, but our bought and paid for “representatives”, will never do it. They have tried the drug testing in several states.. and in fact the number of positive results that came back were so small that most have moved on from this idea. Serious drug addicts often do not have the motivation to actually go through the process of getting welfare assistance.. filling out all the paperwork, providing the necessary documentation, filing appeals, etc..
Then propose to your congressman, like I’ve done, to reenact the Civilian Conservation Corp and open it up this time for both genders and all ages. Instead of getting into fraudulent wars which cost the taxpayer TRILLIONS of dollars, and most importantly, the loss of innocent lives on both sides, spend this money on another CCC project for the homeless. If you’re homeless, it is required that you sign up for a CCC project, or you lose all benefits, period! Then let the cards fall where they may. I have. I have met Lois Capps face to face. I have written to Congress and House members all over our State. Of all members of our State, do you know that only ONE seemed to be vaguely interested enough to personally e-mail me back with feedback at a later date? Wanna guess who it was?? As a side note, you can get EBT benefits at this moment without doing a dang thing right now. It isn’t a whole lot, but if you are homeless, you don’t need a whole lot. You get some cash aid and some food stamp money. We have clear cut housing issues. We do need a functional jobs program in the US. We need a medical care program in the US for citizens that does not bankrupt our citizens. If we can do these things, then there would be absolutely no excuse for this vagrancy. I like where you are going with this. It is hard to stop the benefits before this kind of jobs program is in place. I went a year without a job. Would have taken anything, but was weeded out because I was overqualified. I was fortunate to receive unemployment, which I had been paying in to since starting work at age 14. I like your idea. Working builds self worth. We just need to get the sequence of events right to effectively get to where we both want the job situation to be. Not a complete over generalizing, nor as harsh as some simplifying, but nevertheless, a solution to often addressing “homeless” as a social choice rather than victims of affliction, mistreated through years of conditioning. Most have grown to see the “homeless” as the least desirable people in life, the parasites bred from addiction, unassertive welfare driven second rate human beings, a class of their own made by the choices they make…Perhaps, there is some truth to this, but more likely they have fallen, and by most means cannot get up. To try and propose a plan to herd them up and make them pull their weight in an effort to rise above poverty after being cast out, plagued by physical and mental disabilities from circumstances unique to each and every individual, is to far reaching into a future that the downtrodden lack the ability to foresee, let alone overcome. The biggest concern citizens have with this social disease is the cost to taxpayers, and the need to not see these unfortunate seedless street merchants in our daily grind to do better. They taint a vision of a better life, falling short of progress, our anchors of guilt forged by lack of compassion. One of the biggest complaints as to the “creek people” is the garbage they pile up on the land they squat. Would it not be a better short term resolution to provide weekly trash removal, garbage bags, and start in the right direction, rather than boot them by force from their make shift camps and no thrills living arrangements by dislocation. It is easy to typecast those beneath the benefits you have been provided the opportunity to own, and yet compare your kids dirty room to those without a roof, nor hope of a better life. Most claim this is about “bums” profiting by way of handouts, well, there is not profit, and those with good paying jobs are being paid to much for doing to little, since it is the government that has allowed you to gain your small fortune, and failed to act on its own initiative to prevent this decay in the first place. Done ranting now. Yeah, I was recently at a camp that looks just this one, and I gave some necessities to an older woman that noticeably had severe mental problems. I can only assume that you would call this homeless woman lazy as well, where her mental issues would certainly keep her from any employment. Oh, while I was in the homeless camp mentioned above, I asked around if any Christians visited them and gave them provisions. They told me that no one has visited their camp by giving them anything for a long time, in an “out of sight, out of mind” scenario. Christians, did you enjoy that steak dinner you had last night, as you became a hypocrite to your faith and what Jesus proposed for you to do, in helping the poor 24/7/365? These would be great photos to show a 3rd world country to boost their moral. BLASPHEME! Where are the Christian churches, no matter what division of the faith they represent, where they need to step up to this homeless situation so as not to be hypocritical to their faith! I am sure that Jesus gets so sick and tired of the pseudo-christians not following his direct words within the scriptures relative to helping the poor. Jesus answered, “If you want to be perfect, go, sell your possessions and give to the poor, and you will have treasure in heaven. Then come, follow me.” (Matthew 19:21) Sidebar, when was the last time you saw a Christian follow this Jesus edict? Is it any wonder why Jesus hasn’t returned yet to sweep the Christians skyward to his glorious heaven in His Second Coming? This is probably caused by Christians being outright hypocrites and not worthy of His return because they’re not following his direct commands as stated herein relative to the homeless! Jesus also stated “you will always have the poor”. Are you trying to make Him a liar? Such insolence to Jesus the Christ! Of course we’ll always have the poor, and that is why He was adamant on everyone that wasn’t poor to take care of them! I will pray for you tonight in the hopes that Jesus will not take out revenge upon you for making such an inane statement. You can thank me later. Here’s another taxpayer funded project, and officials are required to store these belongings for a period of time after they’re removed. Plenty of room in SLO. Give us your bums, your unwashed, your huddled masses, your beggars, we’ll pay their way with a 1/2% sales tax increase and rainbow colored parking meters. Who can blame most of the homeless for not wanting to deal with Dee Torres? Word spreads quickly–she’s after your monthly check.